Betsy DeVos wins. Will Common Core and data mining end? Why Are You Letting Your Doctor Kill You? 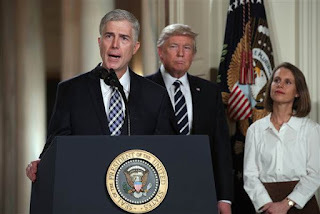 Would Judge Gorsuch on the Supreme Court be some of that promised ‘Winning’? Maybe so! “…The most remarkable thing about the book is its measuredness. Gorsuch is a Jesuit-educated Episcopalian, but he does not rely on theology to make his argument. In fact, he takes pains to ground his work in “secular moral theory,” laying out a careful case based on the writings of thinkers from Aquinas and Epicurus to contemporary scholars Peter Singer and Ronald Dworkin. His work reads more like a philosophy paper than a legal brief, which is appropriate given his background: He holds a doctorate in philosophy from Oxford. This was especially timely, in that I was just grousing to folks, about how, with the rare exception of someone like Justice Clarence Thomas, few in our courts have much, if any, regard for the concepts of Natural Law that our Constitution was drawn out of in our Founder’s Era. Instead, we’ve had to settle for, at best, the more primitive modernist ‘Originalists‘ and ‘Textualists‘ – and now here this fellow Gorsuch is sounding as if I may have to, well, not quite ‘eat my words’, but I may possibly have to nibble on them a bit. Around the edges. And frankly, that’s the kind of crow I’d gleefully chow down on all day long – fingers crossed! Then this evening, in the first opinion I selected, his concurring opinion (starting on about pg 15) in Gutierrez-Brizuela v. Lynch, 834 F.3d 1142 (10th Cir. 2016), which focuses upon how Administrative Agencies have been allowed to overstep their power (to say the least (which the ‘Chevron‘ case is referring to), the concurring portion starts with a Bang! and keeps getting better, and better. My initial reaction to all of this? I’m feeling like I’m in judicial heaven, or at least the Court Candy Store… but… that’s a first impression. And yes, I’ve heard some folks complaining that he didn’t come out with a full throated defense of the 2nd Amdt in another case – worrisome, but it’s a bit difficult to see how that gibes with the ideas put out in this case – if he is stays consistent with the ideas dealt with here, having this judge on the Supreme Court, would be a big step back onto the road to restoring the Rule of Law. Still though, I’ve got quite a bit more reading to do before I really buy into it – good or bad. But so far? This is the kind of ‘Winning!‘ that I could get used to. Background: Republicans promised the American people a full repeal of Obamacare dating back to 2010, when the health care law was first passed. In fact, since Republicans took control of the House in 2010, Congress voted over 60 times to repeal parts or all of the law. Republican Congressional Leadership and President-elect Donald Trump have all promised to repeal this unaffordable, unworkable, and unfair law. In 2015, Congress used a filibuster-proof process known as budget reconciliation to pass an Obamacare repeal bill (H.R.